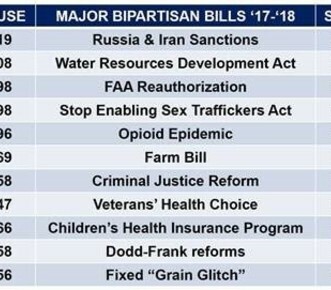 Understanding Alexandria Ocasio-Cortez (AOC) and Ed Markey's new resolution is not legally binding proposed legislation, rather, simply a declaration of aspirations and goals, it has captured the attention of Americans throughout our great country. And whether you agree or disagree with parts or all of it, the GND further advances the idea that environmental policy and economic policy are inextricably linked, and represents another chapter in the ongoing fight about our future as a nation. 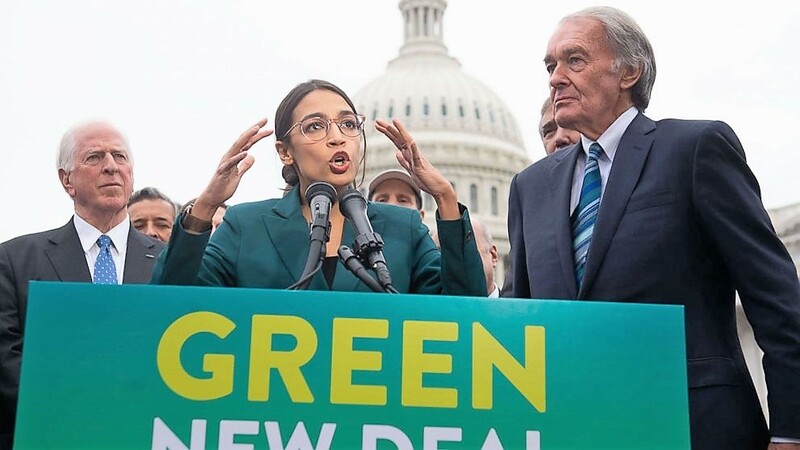 An investment-specific tangent to the publicity generated by the Green New Deal has been the increased attention given to responsible investing (also known as socially responsible investing -SRI - or environmental, social, and governance - ESG - investing) by both institutional and retail investors. 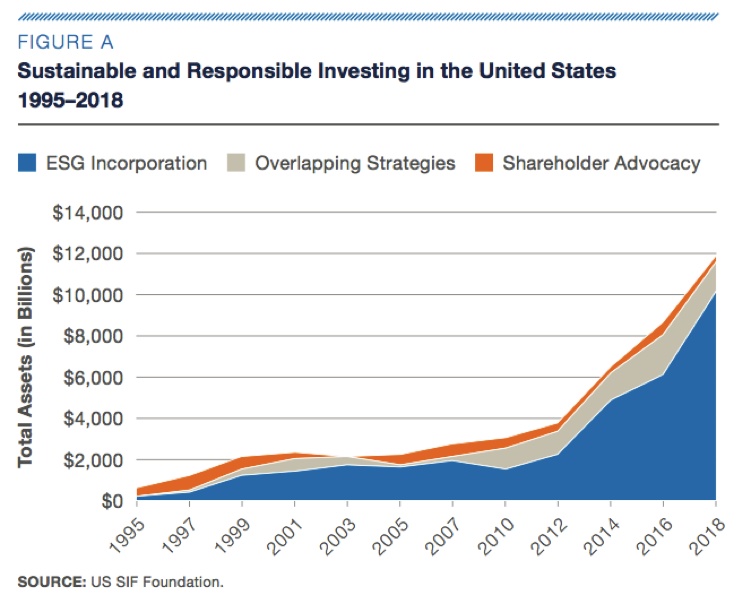 According to the Forum for Sustainable and Responsible Investment, more than one out of every four dollars under professional management in the United States (more than $12 trillion) was invested according to SRI strategies. 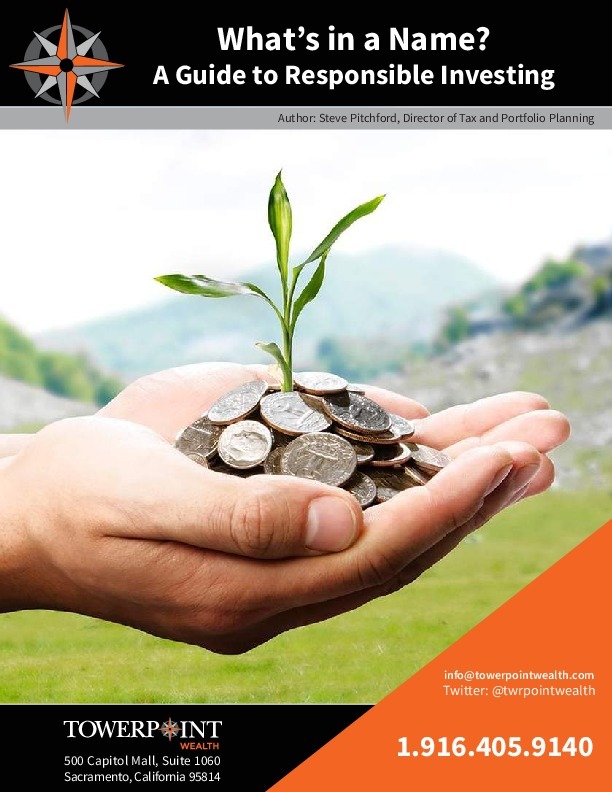 At Towerpoint Wealth, we fully recognize that many of our clients have an interest in ensuring that their portfolio parallels and is reflective of their personal values, and we have embraced this important theme within our overall wealth management philosophy Read more HERE. Recently, we tasked our Investment Committee with the directive of developing a model responsible investment portfolio, and in the interests of making the subject a little easier to understand, we also penned a thorough white paper on the subject. Please scroll down and click on the A Guide to Responsible Investing tile to read it. 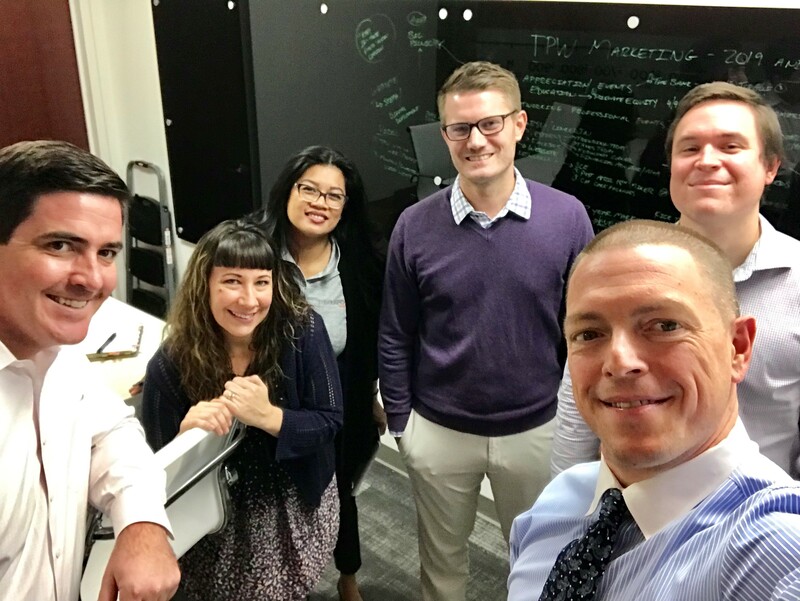 Locally at Towerpoint Wealth, we had a quorum yesterday, which led to a productive brainstorming session about improving our client service standards and outlining key client educational and marketing initiatives for 2019. 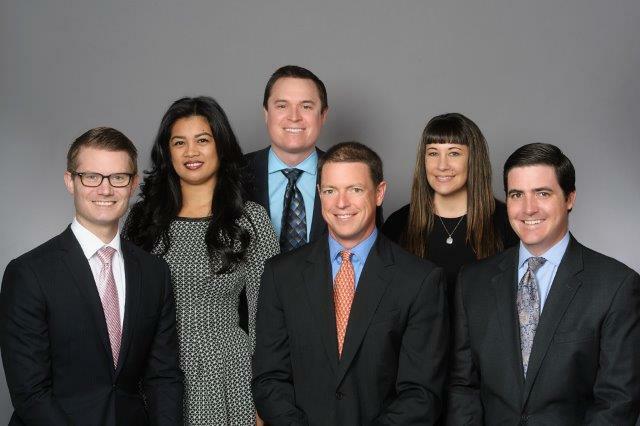 We truly feel blessed and fortunate at the myriad of skills, capabilities, talents, and personality each member of the TPW team brings to the table, ALL in the interests of serving our clients and helping them achieve, and then maintain, their complete financial independence. 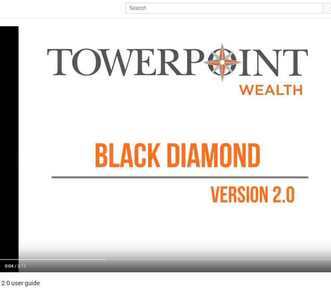 Kick the TPW tires - an excellent three-minute video about the Black Diamond all-in-one software portal used by Towerpoint Wealth private clients, who are able to monitor ALL of their accounts, assets, and liabilities within one singular headache-free platform and secure online portal. 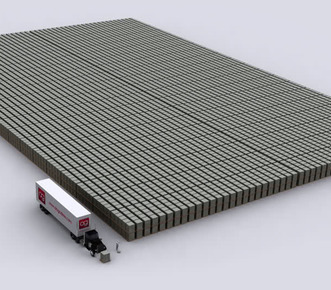 A well-written article discussing the considerations and problems associated with the $22,000,000,000,000 (trilion) U.S. deficit. 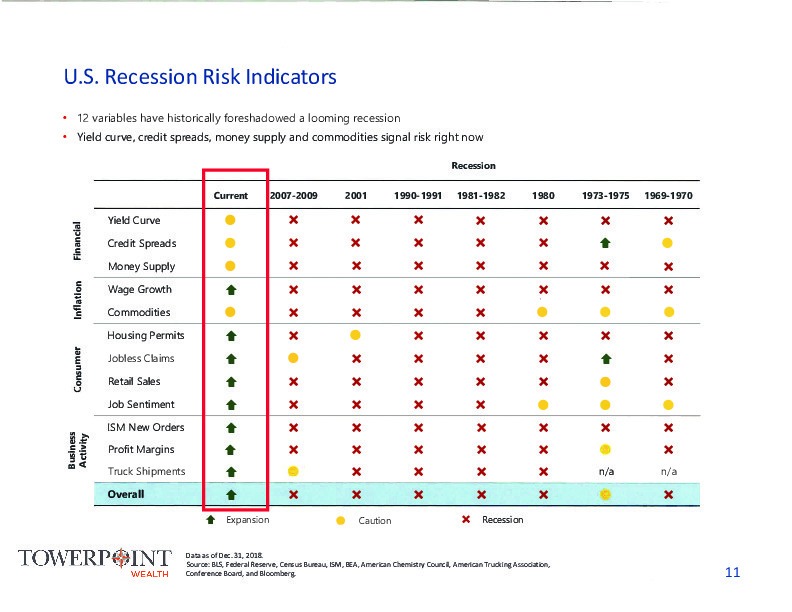 A straightforward image that spotlights 12 different variables that have historically foreshadowed a looming U.S. recession. Hint: We remain positive the economy continues to point in the right direction in 2019.